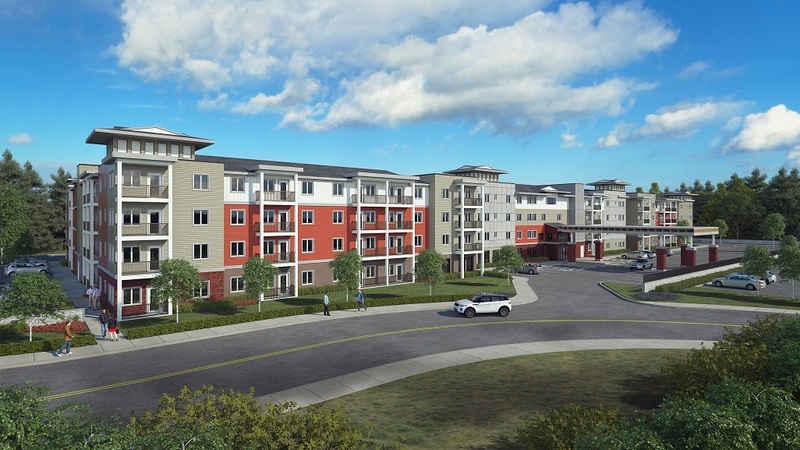 Cedar Pointe Apartments will provide 255 new affordable apartments for seniors in the Smokey Point community of Arlington, Washington. The new development is the first residential community to occur utilizing the City’s recently adopted Mixed Use Overlay District. The development is a luxury 55+ apartment community that will provide 175 one-bedroom units and 80 two-bedroom units, including a one-bedroom manager’s unit. Once completed, Cedar Pointe will offer spacious 1 and 2 bedroom apartment homes featuring modern appliances including full-size washer and dryer, microwave, dishwasher and more. All of the units will be affordable to seniors earning 60% of the Area Median Income (AMI). Located about 40 miles north of Seattle and near the foothills of the Cascade Mountains in Snohomish County, Arlington combines the northwest living with easy access to urban centers and outdoor activities. The site is located along the north side of 172nd Street NE, which is a four-lane thoroughfare that traverses east/west and provides access to Interstate 5 to the west approximately .45 miles. The development will be located near shopping, recreational amenities, transportation and services including the UW Neighborhood Smokey Point Health Clinic and the Stillaguamish Senior Center. Access to groceries, pharmacy, and shopping is convenient, and within walking distance. A post office and the Arlington Municipal Airport is less than two miles away. The Cascade Valley Hospital and the Arlington Library are less than four miles away. The community is also located within a quarter mile of the Smokey Point Transit Center, which has seven bus routes that will allow residents to easily access all of Arlington. In addition, a transit stop is also being proposed at the frontage along 172nd Street. Cedar Pointe Apartments will be constructed on a 4.05-acre site in a single four-story elevator building. The community’s colorful, earth-hued exterior will be bordered by alfresco open-air spaces including two fitness walks, a community garden, fire pit, barbeque area, garden plots and two courtyards surrounded by attractive landscaping. Interior community spaces will include a leasing office, community room, media room, exercise room, yoga room, activity room, social/meeting room, two private dining rooms, and a business center. Prime Contractor: AMWA Construction, Inc.